In the midst of all the travels and prep for travels and arriving home to get right back into the routine, we picked up a new computer screen to replace the broken one! Huzzah! Unfortunately, due to the post-road trip exhaustion and getting right back into the routine, the monitor is still in the box on the floor two days later. And the absolute turmoil in which we left our home has gotten worse. With all of this, I’m having trouble finding the energy to focus on my writing. I woke up in the night from a horrifying yet interesting dream, and I managed to jot down my impressions, but that’s been it for a week or two, or longer. The muscles I use for stringing together words in a fiction are thin and weak from lack of use, and from having to be redirected in other directions. 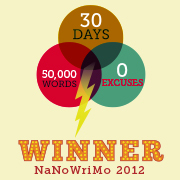 Even the flash fictions I have been composing for this blog feel like a struggle right now. But fiction keeps me healthy. So I have to keep trying. When I completed the exit interviews with my Writer’s Craft students, the overwhelming majority of them said they’d learned this about the process of developing a book: It’s hard. This is why it’s so important to write for yourself, first. That in itself is a challenge. I’m one of those who constantly worries about how my readers will respond to certain things, waiting for criticism with both an expectation of severity and a hope that it will be mild. It’s like waiting to jump into a pool, knowing that there will be an unpleasant shock before you get used to the temperature. There are things in Crystal and Wand that I’m sure are going to upset some people. Gross and horrible and frightening, despicable acts that you wouldn’t want to have happen in real life. So why did I write them? What is it about my personality that comes up with these awful things? 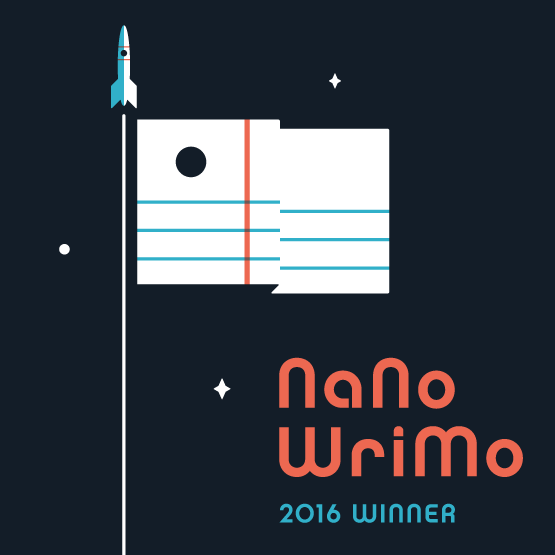 I had to put aside my fear of what some readers are going to think in order to finish the story and feel good about it. Satisfied. And it worked, because I found the ending I’d been searching for throughout the nine years it took to develop this project. But dang, it was hard. And the next project, I suspect, is going to push boundaries even further. It’s just how I roll. I want to write through my fear. Is that courageous, or foolhardy? I once was assigned to read a book in university that cautioned people in its blurb not to buy or read the book, because it was that raunchy. Sadly, I go for raunch. I’m as attracted to the disgusting as I am to the sweet and the festive and the nostalgic. So some of that inevitably ends up in what I write. The thing is, I firmly believe that if you start out intending to write something that is a best-seller and going to make you reams of cash, you’re not doing credit to the art. You’re not doing credit to yourself. I think it’s tangible in the words themselves, that you can see it and feel it in a book written purely for the money. Those books just seem to be . . . empty. Hollow. Void of passion and depth. Writing that avoids taking chances, that is geared solely toward following a trend or stringing out a series beyond its necessary story, just feels wrong. If you want to be a writer, or you are currently wrapped in your own manuscript trying to find its head or its tail, I think you’ll find this to be the most common advice out there: Write the story that you want to read, that you would enjoy. Readers like you will find it. But you have to love your story first. And dang it — that’s hard. 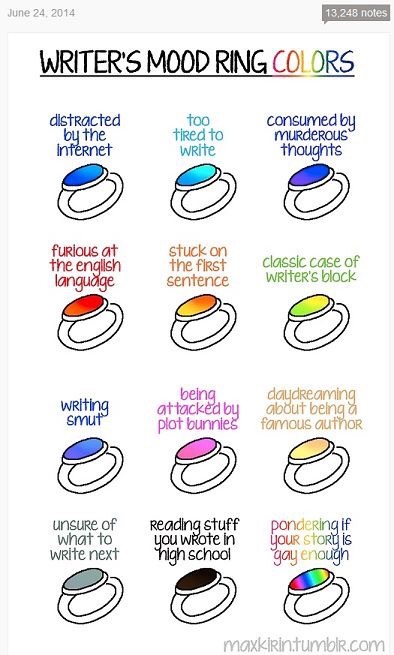 Wouldn’t it be nice if one of these rings actually existed? 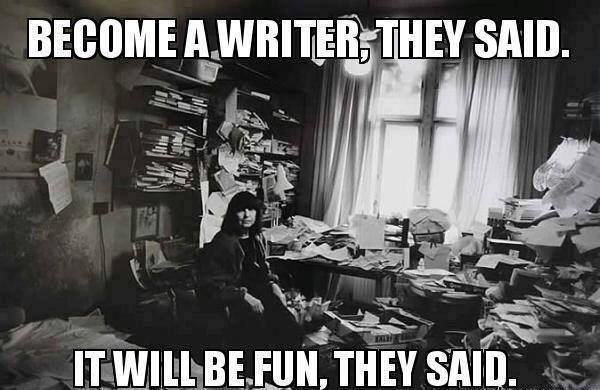 I love these writer’s life posters and motivational swag that turns up on my social media feeds. If I had a separate writing den, I’d be printing them off and sticking them up on the wall behind the door — and on the door — to cheer me during down / grumpy / bitchy moods. Certainly true. Except that sometimes the Internet is a great resource — it’s a library that is accessible from anywhere that has wifi or available digits on the data plan. 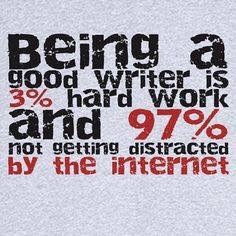 And there are many other ways to get distracted from the work, as my fellow writing parents or writers-with-day-jobs (or writers-with-night-jobs) will attest. Is it worse to be distracted by life matters, funny penguin videos, crotch-shot Vines, or by the next funky idea that pops into your head? AND THE KNOWLEDGE THAT YOU WILL NEVER WRITE IT DOWN . 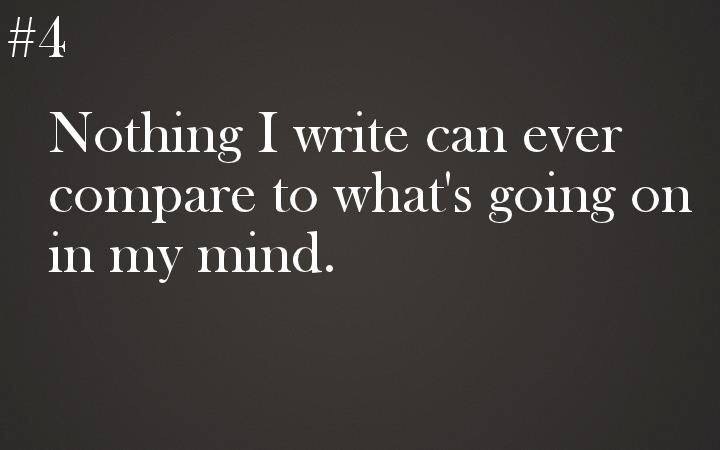 . .
And there is certainly a difference between writing in a good mood, and writing while depressed. 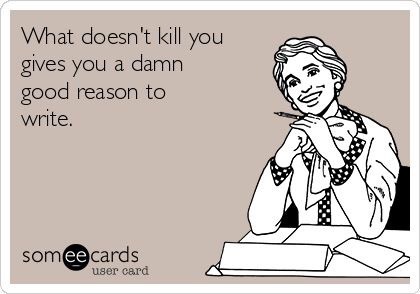 I get the latter often enough. The factors that trigger my mental illness include money issues, having a messy house, feeling overwhelmed by trying to deal with those two things, and the state of the world in general. 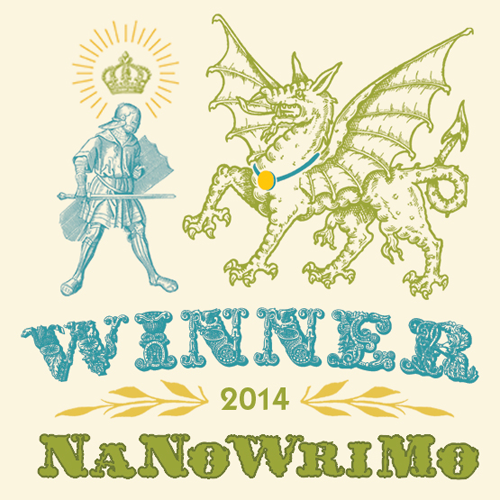 So sometimes I write to escape, and sometimes I write to deal. Sometimes I write to explore different ways of handling things. There’s always a drama coming out of the simplest thing in front of me. For example: when I was picking up clothes from the floor of my bedroom, I saw a spider crawl out from under my side-table. It disappeared under the bed, heading toward one of my shoes. Do you know how many possibilities that raises? Got splashed with scalding hot candle wax on my wrist — I put it in a book. Survival of anything is a great starting point for a story. But so are childhood experiences, road trips, dental appointments, or something someone else has written, if you want to use it as a jumping-off point to explore an idea. It’s the work of expanding the idea into an outline, fleshing out the details, listening to the dialogue as it builds and discerning the environment. (That is, if you’re a planner. If you’re a seat-of-the-pantser, forget the outline part.) When the details start rolling, that’s when the Net can be your friend once again. 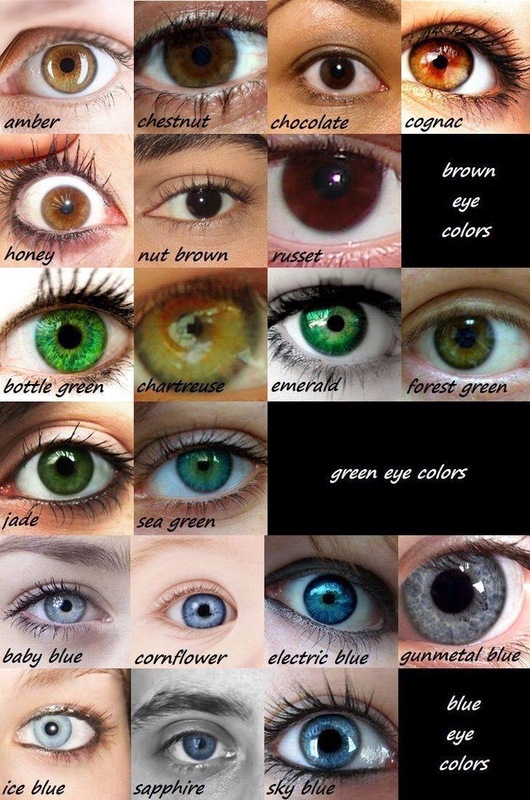 Look at the neat poster I found with eye colours on it! And on top of all that, there are the awesome cosplay / costume contact lenses out there now that look like zombie eyes, tiger eyes, vampire eyes, cyborg eyes . . . Writer brain now ponders a story idea based on a problem with contact lenses. An infection? A tiny circuit that starts boring through the visual cortext and into the brain? Mind control? Loads and loads of paper. Sticky notes flapping from every flat surface. Woe betide the family member who moves too quickly past the stack of papers and sends it careening to the floor. This is where bulletin boards can come in handy. I’ve been finding that taking pictures of the notes is helpful, too, because then I can’t lose them. I’ve rcently come to realize that I am not a minimalist. I’m not one of those who can sit in an empty space and focus on the story. Nor can I write in a mess. There’s a balance to be found in there, somewhere. I’m just still looking for it. 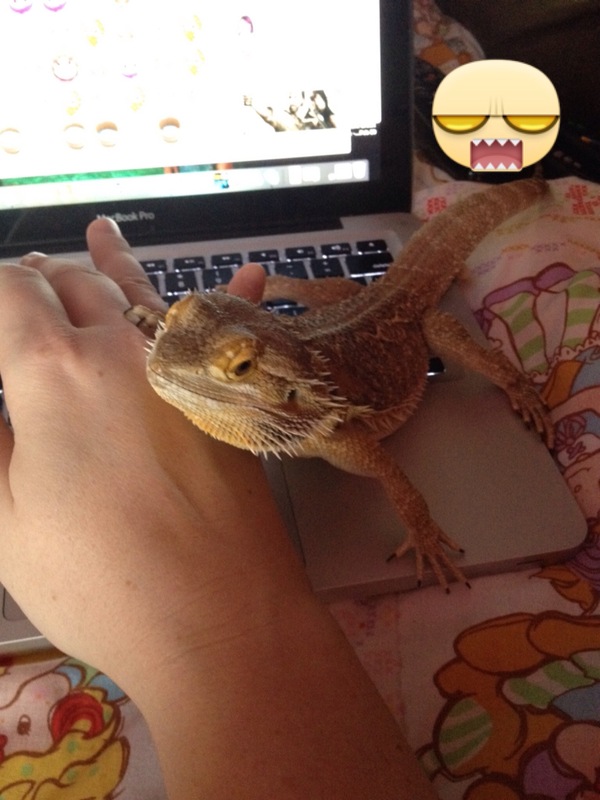 So remember waaaay back in March when Elizabeth Reptile, my awesome bearded dragon, pooped on my condom-less computer keyboard? Yeah. I’m still waiting to get my hard drive back from the technician, although it should be any day now… The last we spoke about my options, I could pay upwards of $700-$800 to replace a key part (motherboard? Leaderboard?) and the keyboard, OR I could pay for the hard drive to be extracted and encased and sent back to me. Some people wreck cars regularly. I do this to computers, evidently — this is not the first time I’ve had to ask for the brains of my computer to be removed and sent to me. I honestly don’t even know where I’ve put the first hard drive — I know it’s somewhere in my house! That was an incident involving my young daughter and a cup of tea and a wildly swinging chubby little leg. Again, can’t emphasize enough — the keyboard condom would have saved me, folks. Type safely! Be responsible! Anyway, he’d said he was sending me the hard drive ASAP and I could pay him when I got paid next. Except I’ve lost his email, and when I upgraded my phone, I waited too long to bring over my messages from the back-up and I’ve lost the messages that tell me where to send the money. I’m sure he’s sick of hearing from me by now, but dammit . . . I’ve been without my files for nearly four months! 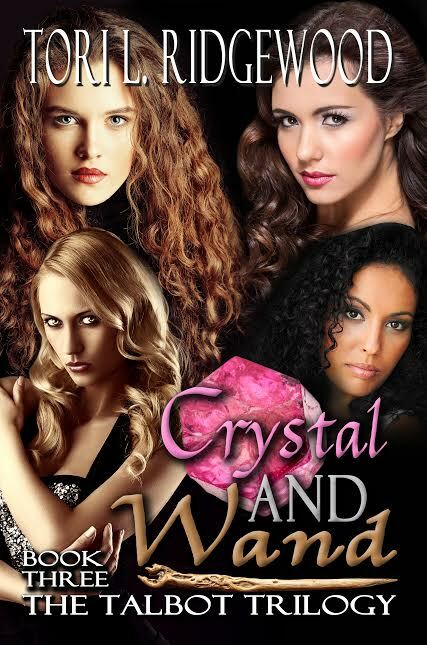 One of the things I need from my hard drive is the play list I was building in my iTunes for Crystal and Wand, and I don’t believe that I ever finished the one I was making for Blood and Fire, either. Life got in the way. Worse, once I actually get the hard drive back and connect it to this desktop, I may still lose the playlist because I’ve noticed that they don’t always stick around after an update. The good news is that I’ve heard new songs — MANY new songs — since I started those, and I think there are some changes I’d want to make anyway. Plus, I recall at one point hitting a button on the iTunes thingy that rearranged the order of the songs alphabetically — quelle nightmare! Still, I shall move forward. Go through my music, start again, include some of the new tracks I’ve been listening to that remind me of events and characters in Crystal and Wand, then go back and do the same in Blood and Fire. Eventually, the playlists will make it here. And as soon as I know the release date for the final book in the Talbot Trilogy, you’ll know — I promise!